Snowpack conditions in the upper portions of the profile are loose and wet. Hardness testing shows 4 finger to fist hardness values. Free water is present in these layers as a result of recent rains and above freezing temperatures day and night. Weather forecasts through Saturday predict more of the same: no freezing and 0.23 inches of rain. Backcountry travel under these snowpack conditions will be difficult as penetration is expected to progress deeper into the snowpack. Travelers are advised to factor these conditions into their travel plans and avoid travel on steep slopes during warm or rainy weather. Today was an absolute lousy day for pictures, low clouds with fog. Bright spot of the day was cutting my first bear track as it came off the shoulder of Rock Candy Mountain down to the West Fork Yaak River. Travel to the back country continues to be a challenge with significant stretches of bare ground to navigate. The upper Yaak region showed a 7% SWE increase in the last week! The East Cabinet Range remained steady at 43% of average SWE, West Cabinets at 46%, and southern/eastern Purcell Range at 55%. 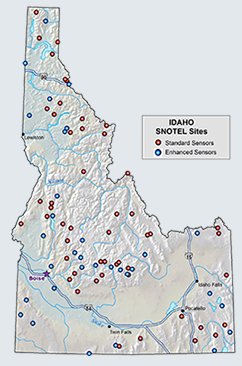 As you might expect, year to date precipitation for all SNOTEL sites is near normal because of two massive rain storms (Feb 6/7 and Mar 14/15) that delivered nearly 14 inches of rain. Best advice under our current conditions is to wait for more normal weather, ie. overnight freezing to provide a safer platform for travel. That is not going to happen this weekend, so maybe try something new off snow. Thursday I visited the headwaters of West Fork Yaak River 5,900 feet near Rock Candy Mountain 7,204 feet (Purcell Range) located 40 air miles northwest of Libby. There I encountered a 46 inch deep snowpack. The top 12 inches is wet and loose from recent rains and above freezing temperatures. Below that the snowpack consists of numerous crusts varying in hardness from pencil to knife hard. Snowmobile and ski penetration is 4-6 inches and boot penetration is 12-14 inches. Extended Column Tests yielded ) no propagation at 4 inches (ECTN 9) from the surface. This was the highly modified new snow layer from Tuesday-Wednesday. Continued testing yielded partial propagation at 18 inches from the surface (ECTN28). This portion of the column included 8 inches of loose wet material and 6 inches of knife hard crusts. Since the Friday March 20th advisory, weather in the Kootenai region has been warm and wet. All SNOTEL sites are reporting above freezing temperatures day and night, except for Tuesday morning and Wednesday morning. 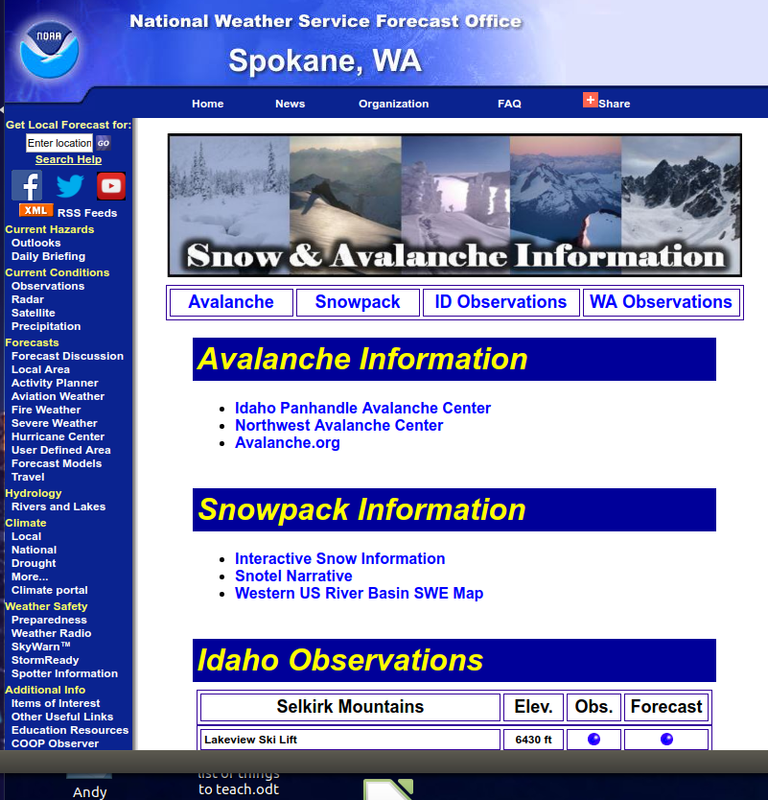 SNOTEL sites are reporting SWE gain (+0.7 to 1.9 inches) and precipitation (+0.5 to 0.7 inches) above and beyond SWE. Snowpacks throughout the region continue to show depth consolidation and SWE drain. Weather today in the headwaters of West Fork Yaak River near Rock Candy Mountain was total cloud cover with valley fog, 35ºF, calm winds, and no new snow. Forecasted weather through Saturday is for mostly cloudy skies, temperatures above freezing day and night, southwest winds 7- 20 mph, and 70% chance of rain Friday afternoon into Saturday with 0.23 inches possible. Freezing levels will be above 6,000 feet.